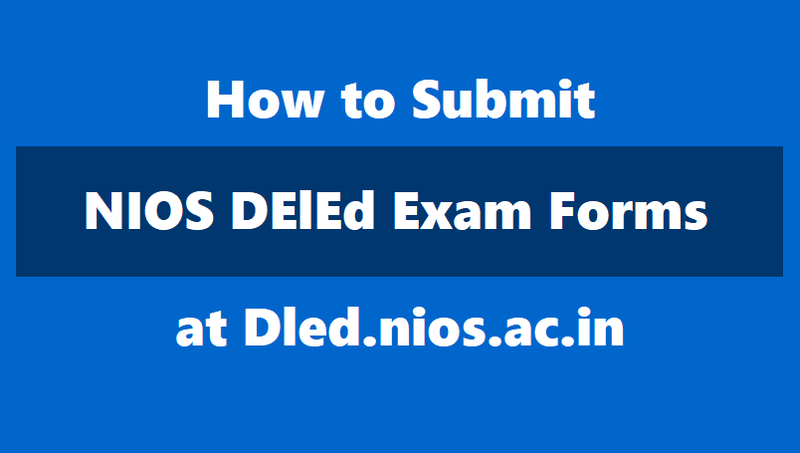 How to Submit NIOS DElEd Examination Forms @ Dled.nios.ac.in, How to Apply for NIOS D.EL.ED Exams 2018, How to fill NIOS DElEd Examination Forms, How to pay NIOS DElEd Exam fee, payment of NIOS DElEd Exam fee, Process for Online Submission of Examination Fees. NIOS D.El.Ed Registrations 2018 at dled.nios.ac.in: how to apply: The National Institute of Open Schooling (NIOS) has released the examination forms for the DElEd on the official website, the link for which is dled.nios.ac.in. Meanwhile, no offline examination forms will be accepted from the candidates. The examinations forms can be submitted at NIOS DElEd portal using the teacher login details, as reported by NIOS. The Programme aims at enabling the target group to develop in them skills, competencies, attitudes and understanding to make teaching and learning more effective. Note: The NIOS DElEd candidates may submit their forms for three courses: 501, 502 and 503. NIOS-DElEd - Training for the untrained in-service Teachers: Diploma in Elementary Education (D.El.Ed) programme is a specifically designed package for inservice untrained teachers working in primary/ upper primary schools of different states of the country. The programme has been developed by the Academic Department, NIOS on the initiative of Ministry of Human Resource Development (MHRD), Govt. of India, keeping in view the NCF 2005, RTE 2009 and NCFTE 2010. The Programme aims at enabling the target group to develop in them skills, competencies, attitudes and understanding to make teaching and learning more effective.